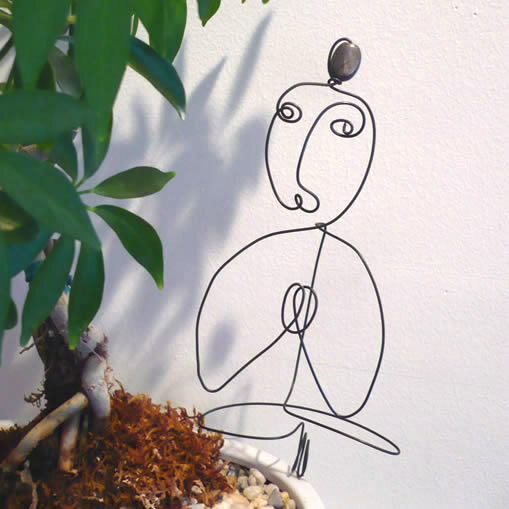 5" tall figure in black steel wire (19 gauge). Plant Spike extension makes it great for placing in your favorite potted plant or as a house-blessing gift inside a plant. Natural rusting patina may occur after prolonged exposure to moisture but will not detract from its plant enhancement effect. Since these are one-of-a-kind, handmade art pieces please expect some natural variety and uniqueness between photo and actual piece when it arrives. Each figure has its own unique name / blessing tag attached with removable wire.